Achza is my solid black rescue cat. She is a cheerful black hole who absorbs all light around her. An animator's dream for the perfect reduction into silhouette. Except for her intense yellow eyes, you don't clearly see any of her features, there is only a perception, highlights here & there giving away the details of her form. Colors and values are used to describe a shape, but mosaics have andamento (the flow of tiles) to add another dimension with texture and rhythm. I wanted only this aspect to describe her shape. 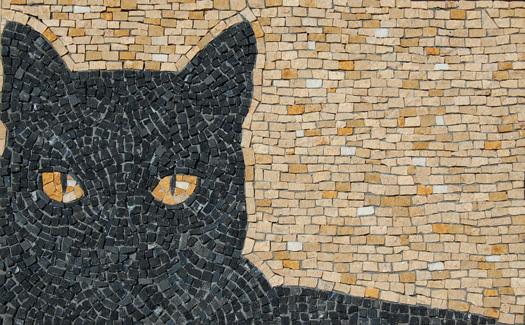 Mosaics, in most cases, are made to be seen from a distance, to have all the little bits blend together to give you the entire image. However, I love the challenge of adding interest when you view it close-up as well. After all, most of my work does not end up suspended 30 feet in the air on a ceiling. Thus, "Achza Silhuoette" was designed to work from a distance as well as offer continued new things to enjoy up close. The whole is a stark contrast, as with Achza, but light plays off the little pieces of marble and gives you all the clues to see what lies within the darkness.